We have a new livery for our DHC-2 Beaver. Recolored by Jonathan Norman, he said he used to fly with his friend who flew N92AK Beaver. 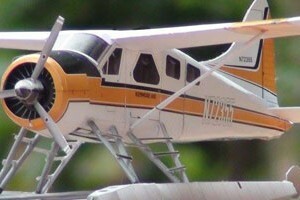 When his friend asked him where to find a wooden scale model of a DHC Beaver, he had something else in his mind. This paper model is in 1/32 scale. Big enough to have a decent details. The model wing will have about 45 cm wingspan. You need to use 3 type of paper or card, for the main template 160-200 gram card will be good and for the struts and spinner you will need 80-100 gram paper and the last is 1 mm thick cardboard. I also made a new numerical system, the formers will have F letter on the front and G for glue-tabs and each elements have the same number, in example if part 4 has glue-tab it will be G4 and if it has former, it will be F4. I made a slide show video on youtube about this build, you can watch it here. Please Subscribe my channel of you like :). This is my first paper model in 2018 after months in a hiatus. I don't know how to describe it, but it's not a comeback release. I'm still struggling to find a way to make more models as in the past. I can't promise you anything this time. But I was enjoyed designing this template and build it myself after so long haven't got a chance to do it. About a month ago I play so many hours in Microsoft Flight Simulator X for the first time. In the early computer game age, I was into simulator games, like Chuck Yeager Combat Simulation, F-117 Nighthawk or A-10 Tank Killer. All still in DOS format, but when Microsoft Flight simulator came I haven't tried it yet until last month. It was very addictive if I may say, it brings back a joy of flight sim experience, with lots of keyboard commands like the real plane. And then this Kenmore Air DHC-2 Beaver caught my eyes, I have to make a paper model of it, because it's a beautiful plane. I'm also planning to make it flyable as an RC model plane, but first I need to make the paper model first. So here it is, the model is in 1/32 scale. Big enough to have a decent details. The model wing will have about 45 cm wingspan. You need to use 3 type of paper or card, for the main template 160-200 gram card will be good and for the struts and spinner you will need 80-100 gram paper and the last is 1 mm thick cardboard. I also made a new numerical system, the formers will have F letter on the front and G for gluetabs and each elements have the same number, in example if part 4 has gluetab it will be G4 and if it has former, it will be F4. I made a slide show video on youtube about this build, you can watch it here. Please Subscribe my channel of you like :). To help bring Internet connectivity to more people, Facebook is designing solar-powered airplanes that will beam Internet signal to people in remote, underserved regions within a 60-mile diameter. Each aircraft is designed to be in the air for up to 90 days at a time. It first maiden flight was on 28th June 2016 for 96 minutes flight time and then the second flight was on May 22 2017. A few days after that, someone from Aquila's project contacted me to do commissioned on Facebook Aquila UAV papermodel. He said when it's done it will be shared for free to all of you. I haven't ask his permission to mention his name in this article, so I'll leave it that way for the moment. This model template design was based entirely on publicly available images on the Internet, it is not based on the actual technical drawing. 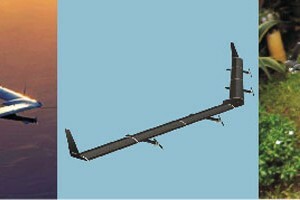 So here it is the template of Facebook Aquila UAV 1/72 papermodel. The built model wingspan will be about 45 cm. I am not an aeronautic major, I'm just a RC plane modeller as a hobby, I wonder it's must be hard to make that long wing rigid. It is very long, it's a beautiful aircraft. I test build the paper model myself and when I see the result, I think it's quite good for who haven't build any paper craft for years. The assembly instructions are included on the template. Have a nice build :). 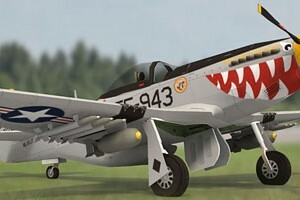 Another recolor version, this time is P-51D Mustang. It's from Korean War era (1950-1953). P-51D Mustang was still use by US Air Force in the Korean war as a close air support, with bombs and rockets. This war-horse FF-943 "Was That Too Fast" was stationed at Chinhae Airfield from 1951, it was one of 18th Fighter Bomber Group. In 90s I remember playing a aircraft simulator PC game, titled "Chuck Yeager - Air Combat" and I was playing in the Korean theater using P-51D Mustang against Mig-15 jet fighter, then P-51D was replaced with F-86 Sabre in the next missions. I added additional patterns on the page 6, those are patterns for bombs and rockets. Usually I build the RC plane first and then later I release the papermodel version of it, but often I became lazy and it never happened. So this time I made the paper version first. 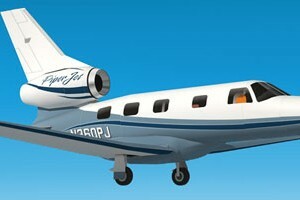 This model is a single engine very small corporate jet from Piper Aircraft Inc, a PiperJet. I found this plane very beautiful and I want to make an RC plane of it. I love their Cherokee, I already made an RC of it and it flew so good very easy to handle. Sadly this Piper PA-47 PiperJet never went into production, the project ended after they made a prototype and first flew on 2008. They even redesigned the PiperJet and then came PiperJet Altaire, but once again they cancel it due to economic conditions on 2011. 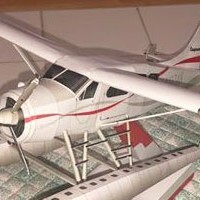 I made this papermodel in 1/33 scale, the model will have 40 cm or 16 inches wingspan.